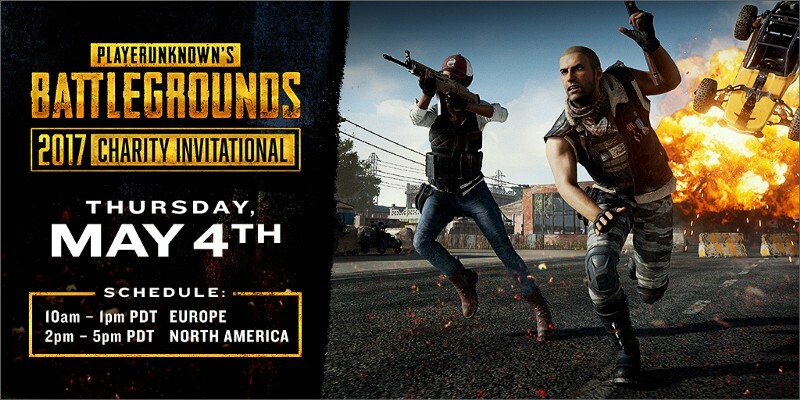 We’re excited to share PLAYERUNKNOWN’S announcement on the PUBG blog that their 2017 Charity Invitational will be live on Twitch on Thursday, May 4th. This awesome tournament will feature DUOS mode matches featuring both European and North American brackets over two sessions. In the first session, 32 teams from the EU will compete in three matches, followed by 32 teams from NA competing in three matches in the second session. Over the next several days leading up to the event, we will share in announcing the participants in this invitational, all of whom are Twitch streamers. You’ll be able to follow all of the action on each streamer’s channel as well as the main playBATTLEGROUNDS Twitch channel observed by Chris “Panky” Pankhurst. Best of all, this amazing tournament is in support of Gamers Outreach, who provide kids in hospitals with recreation and therapy through the power of video games!